Marlton, NJ, March 27, 2019 --(PR.com)-- Dynamic Defense Technologies, LLC (DDT) has delivered four of it’s new Rolling Rescue mobile ballistic shields to two local police departments. The Voorhees Police department and the Long Beach Township Police department each purchased two shields. Dynamic Defense Technologies, LLC (DDT) provides life saving, head-to-toe ballistic protection for police and civilians that are in harm’s way. The Rolling Rescue is a mobile solution that offers full protection against small arms, high caliber rifles and has superior multi-hit capabilities. The Rolling Rescue provides shelter from active shooters in a variety of settings. 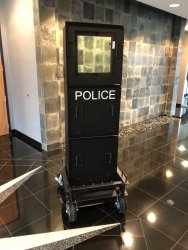 Whether the threat is in a school, government building or private business, the mobile ballistic shield gives those in harm’s way the protection that is needed. DDT uses the patented technology of McCurdy’s Armor through a licensing agreement with affiliated Dynamic Defense Materials (DDM). DDM has been delivering their patented McCurdy’s Armor portable armored wall system for the past ten years to military and law enforcement in the most hostile areas around the globe. This lightweight system has primarily been used as guard posts to protect troops and police by providing protection against small arms, mortars, rockets, artillery, and IED’s. “The Township of Long Beach is thankful for the Rolling Rescue mobile ballistic shield. These shields will help protect our Police force and in turn, help protect the citizens and children of Long Beach Island,” said Long Beach Township Mayor Joseph Mancini. For more information about Dynamic Defense Technologies, LLC, please visit www.RollingRescue.com. Dynamic Defense Technologies, LLC (DDT) is based in Marlton, NJ and manufactures the Rolling Rescue, a mobile ballistic shield. The Rolling Rescue is available in two models: the standard unit, which is one full length frame and the tactical unit, which consists of a three piece frame, for easy transport. The unit can be assembled in a matter of seconds.